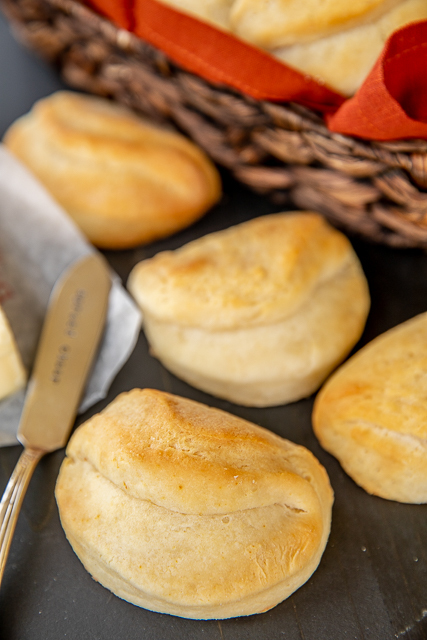 These Make Ahead Pocketbook Rolls are perfect for your holiday meal. You can make them TODAY and keep them in the refrigerator until you are ready to bake them on Thanksgiving day. How awesome is that?!?!?! 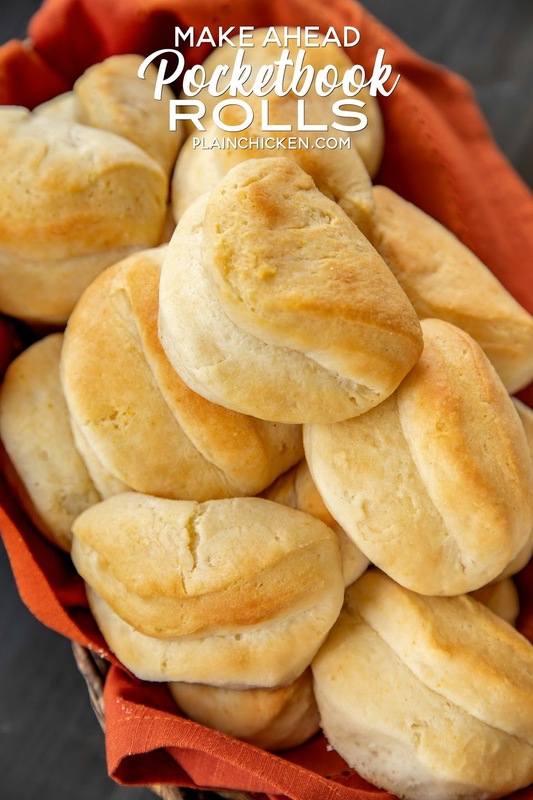 Not only are these rolls able to be made well in advance of baking, they are also SUPER delicious!! 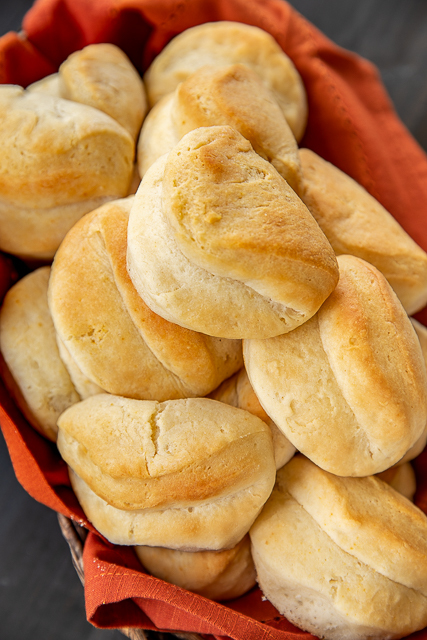 This recipe will make about 3 dozen rolls. If you don't need that many, you can cut the recipe in half. I personally just make the whole batch and make a few here and there since the dough will keep for 2 weeks in the refrigerator. This recipe uses self-rising flour. I like to buy White Lily self-rising flour. If you don't want to fool with buying self-rising flour, you can easily make your own. 1 cup all-purpose flour, 1-1/2 tsp baking powder and 1/2 tsp salt. Just make sure your baking powder is fresh otherwise you will have hard rolls. 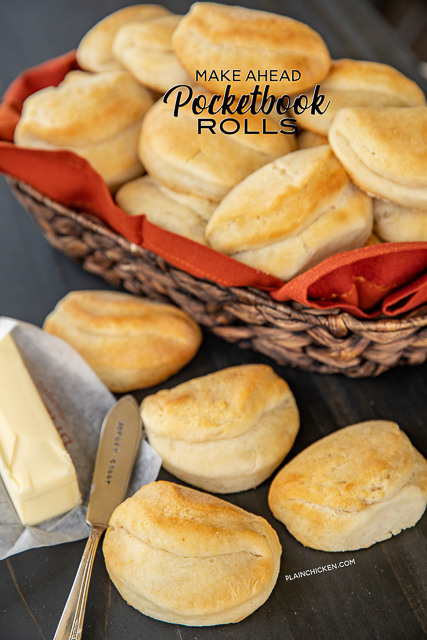 We LOVED these Make Ahead Pocketbook Rolls. They are light and fluffy and taste best slathered with butter!! I'm really looking forward to baking up a big batch next week. They are the perfect accompaniment to your holiday meal! In a small bowl dissolve the yeast in the lukewarm water. Set the bowl aside. In a large bowl, combine the flour, baking soda, and sugar. Cut in the shortening with a pastry cutter or two forks. Add the yeast mixture, and buttermilk. Mix until a dough forms. Cover the dough and place it in the refrigerator overnight or up to 2 weeks. 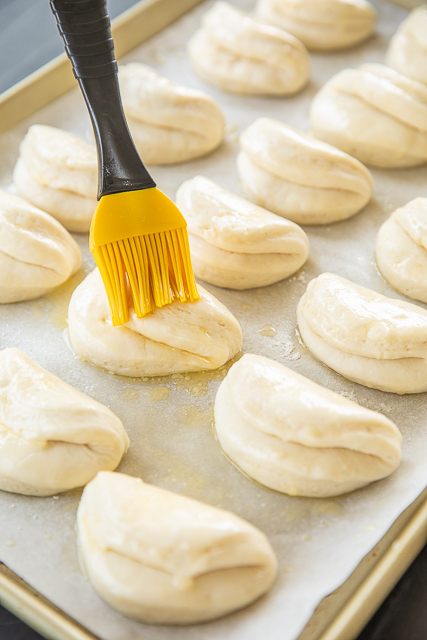 Two hours before serving, remove the dough from the refrigerator and place it on a floured board. Punch down and knead slightly. Roll the dough out to a 1/2-inch thickness. Cut out with a biscuit cutter. Reroll scraps and cut out additional rolls. Brush the tops with melted butter and fold over. Place on a parchment lined baking sheet. Cover and let rise about 1 hour. Rebrush therolls with melted butter. Bake 15 minutes, or until golden brown. Serve immediately. Wow, I love that these can keep two weeks in the fridge! Great recipe! Can I use a Kitchenaid mixer to make these? You can try it. I recommend still cutting the shortening in by hand, but then you could use the mixer. What size cutter do you recommend? Hey, this recipe doesn't need any salt?